To provide excellent service and quality workmanship at affordable prices by pleasant, friendly service technicians. Preferred Cleaning Service Inc. was started in 1983 as a janitorial service by owner/operator Glen Schopf. By 1990, business had grown. Glen added carpet cleaning to his services provided and son Rick joined the company. Six more years down the road, Glen’s youngest son David joined his father and brother in the business. Preferred Cleaning has since expanded it’s services to include the cleaning of carpets, upholstery, tile/vinyl floor stripping & waxing, ducts and flood restoration. Rick and David are IICRC certified; they go that extra mile to remove tough stains and rejuvenate dull matted carpets. Preferred Cleaning services both Residential and Commercial clients. Property managers find they can depend on Dave and Rick to give timely, courteous service. We use truck mounted hot water extraction equipment. Our pre-treatment, spot treatment and rinse are environmentally friendly. 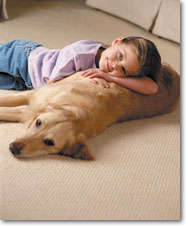 Your children and pets are safe from hazardous chemicals and your carpets are left solvent and residue free. 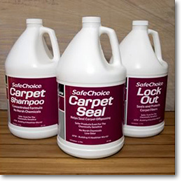 SafeChoice Carpet Shampoo is formulated without the use of butyl ethers and other irritating chemicals which can be especially dangerous to chemically sensitive people, young children and pets. A strong cleaner and odor remover, SafeChoice is odorless and dye-free. When used properly, it leaves no residue — carpet is not “crunchy” after drying.